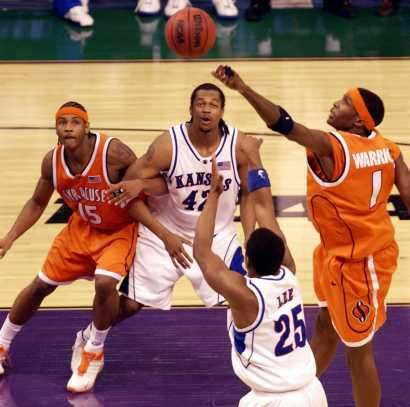 The 2003 NCAA Men's Division I Basketball Tournament involved 65 schools playing in single-elimination play to determine the national champion of men's NCAA Division I college basketball. It began on March 18, 2003, and ended with the championship game on April 7 in New Orleans, Louisiana. A total of 64 games were played. Syracuse, coached by Jim Boeheim, won the national title with a 81-78 victory in the final game over Kansas, coached by Roy Williams. 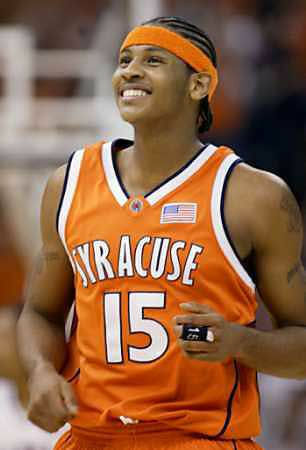 Carmelo Anthony of Syracuse was named the tournament's Most Outstanding Player. Syracuse beat four Big 12 teams on its way to the title: Oklahoma State, Oklahoma, Texas and Kansas. Those helped earn Boeheim the national title that had eluded him in 1987 and 1996. 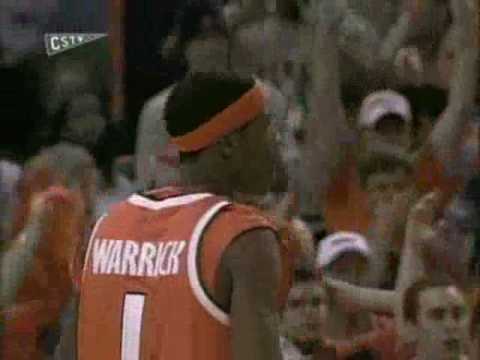 Because of the start of the Iraq war, CBS moved its telecasts of the games played on the first Thursday afternoon of the tournament to ESPN, allowing for expanded news coverage. To make up for lost advertising revenue, an additional time slot was opened the following Sunday evening for more CBS telecasts. The Louisiana Superdome was host of the Final Four and National Championship in 2003. Freshman Carmelo Anthony scored 33 points leading the Syracuse Orangemen past the Texas Longhorns in the night cap of the National Semifinal doubleheader. Syracuse opened up a comfortable 2nd half lead, but that was trimmed to four with just 1:08 remaining. However, freshman Gerry McNamara iced the game with clutch foul shooting in the final minutes. 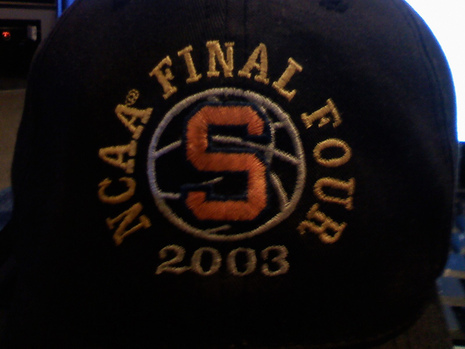 The win put Syracuse and coach Jim Boeheim one win away from their first ever National Championship. Texas was the last number one seed remaining in the tournament. It was as if only three teams had advanced to the final four as the Kansas Jayhawks routed the Marquette Golden Eagles by 33 points, the fourth largest blowout in final four history. Keith Langford led the Jayhawks with 24 points, and Kirk Hinrich and Aaron Miles each added 18 points. Like Boeheim, Kansas coach Roy Williams was just one win away from winning his first ever National Championship. This battle was described as which future hall of fame coach would win his first ever national title. Jim Boeheim was in his twenty-third season as Syracuse head coach, and Roy Williams was in his fifteenth season as Kansas head coach. Both had been disappointed with previous championship game losses (Boeheim: 1987,1996 Williams: 1991). Syracuse dominated with a hot shooting first half to lead by 11 at the break. Gerry McNamara connected on an impressive six three-pointers in the half, which were his 18 points for the game. Kansas fought back to within 80-78 in the final minute and had a chance to tie after Hakim Warrick missed a pair of free throws in the final moments. Warrick would more than atone for his missed foul shots as he came out of nowhere to block Michael Lee's three point attempt with 0.7 on the game clock. After Kirk Hinrich's three-pointer at the buzzer went over the net, Syracuse's victory gave them their first ever national championship, and coach Jim Boeheim the championship he had been chasing all his years at Syracuse. After they won, Coach Boeheim is seen on the sideline actually happy, a true accomplishment in his amazing career. Carmelo Anthony was named Most Outstanding Player (MOP) with 20 points in the win. Syracuse also avenged a second-round loss to Kansas two years earlier. NEW ORLEANS -- This time, Jim Boeheim survived a wild finish at the Superdome. Hakim Warrick blocked a potential tying 3-pointer with less than a second left and Syracuse captured the first national title in school history by holding on for an 81-78 victory over Kansas. Syracuse (30-5) erased the memories of its last championship game in the Superdome, a 74-73 loss to Indiana on Keith Smart's late jumper in 1987. That loss had haunted Boeheim, who said he refused to watch replays of the finish, but finally earned his first national title in 27 years as Syracuse coach. NEW ORLEANS (AP) -- There's a lot more to Carmelo Anthony's game than the raw numbers on the Syracuse side of the boxscore. The freshman with NBA talent scored 20 points, had 10 rebounds and seven assists Monday night in the 81-78 victory over Kansas that gave the Orangemen their first national championship.